In what could prove to be an entertaining slugfest, former world champ Brandon Rios and former European welterweight champ Sam Eggington will fight one another on the under-card of the September 22 Anthony Joshua-Alexander Povetkin heavyweight title fight. The fight taking place is reliant on Eggington, 23-4(15) winning his fight tomorrow night on the Amir Khan-Samuel Vargas bill, when the 24 year old will face the 11-2(7) Hassan Mwakinyo. Dan Rafael of ESPN.com reports that the fight is set to take place at a catch-weight of 150 pounds and that should “Bam Bam” defeat Eggington, he will have further fights under the Matchroom banner. 32 year old Rios, 34-4-1(25) was last seen getting knocked out by Danny Garcia (in a fight he was doing quite well in before the big punch came from Garcia in the ninth round) and he has won just three of his last seven bouts. 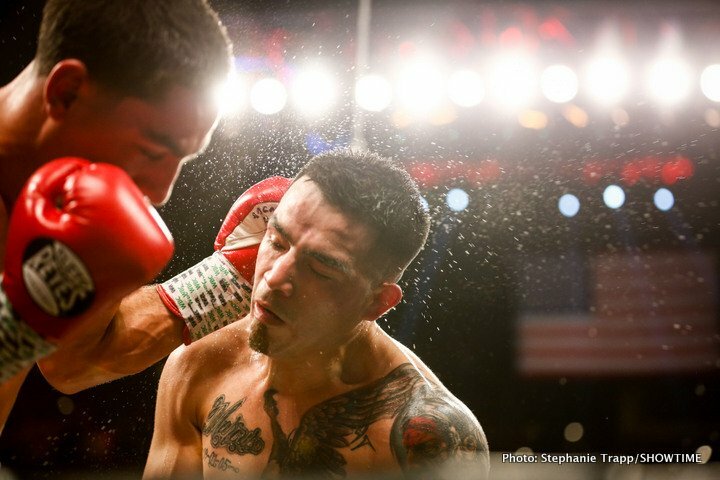 At his best down at lightweight, Rios was thought to be finished after his November 2015 stoppage loss to Tim Bradley, yet after a layoff, Rios returned with a win last June – but was then stopped by Garcia. Eggington will be looking to add Rios’ big name to his resume if the fight goes ahead (and Eggington should win tomorrow night, barring a big upset) – much in the same way he added Paulie Malignaggi’s name to his list of stoppage victims a few months back. How much has Rios got left? As a supporting feature, Rios-Eggington is not a bad fight, and it might even produce some real fireworks. Rios has a fan-friendly style, as does Eggington. Both men throw plenty of leather and neither warrior is afraid to take some back. Rios’ best days have certainly gone but the Oxnard warrior could prove to be too much for young, less experienced fighters like Eggington. With there being just two weeks between tomorrow’s fight and September 22, Eggington must not only win but must also avoid picking up any injuries such as cuts. Two weeks is indeed a quick turnaround for any fighter to take any fight. Next boxing news: Oleksandr Usyk & Jono Carroll Sign With Matchroom Boxing!